The Oxford Handbook of the Cold War. Readers who turn to the Oxford Handbook of the Cold War expecting a standard reference guide will be surprised. As they explain in their introduction, the editors deliberately did not “solicit essays that focused on particular way stations and watershed moments throughout the history of the cold war” (p. 2). Hence the Handbook does not include chapters on topics such as containment, the Marshall Plan, the Cuban missile crisis, the Korean and Vietnam Wars, or Détente. And while the dust jacket features the inevitable image of the Berlin Wall, neither the building nor the fall of the Wall receives much attention. The editors concede that the “superpower rivalry between the United States and the Soviet Union” (p. 1) remains relevant, but should no longer be seen as an exclusive paradigm. They promise that the Handbook will provide a “wide-ranging reassessment of the cold war based on innovative conceptual frameworks” (p. 1). Not surprisingly, the key conceptual framework is to be found in a global history that “reveals nuances, idiosyncrasies, and complexities obscured by more traditional accounts” (p. 2). Rather than choosing a chronological approach, the editors have grouped the Handbook’s thirty-four essays into four main parts: conceptual frameworks, regional cold wars, and strategies of waging the cold war, as well as social and cultural developments that challenged the cold war paradigm of a bipolar geopolitical superpower conflict. The concluding essay on “The End of the Cold War,” oddly listed as a fifth part, appears to be strangely mistitled, however. The author, Nicholas Guyatt, offers no analysis of why the cold war came to an end other than blaming the demise of the Soviet Union on Gorbachev’s reforms (pp. 605–606) and mainly lambasts Western triumphalism, American post-cold war unilateralism, and the rise of neoliberal capitalism. 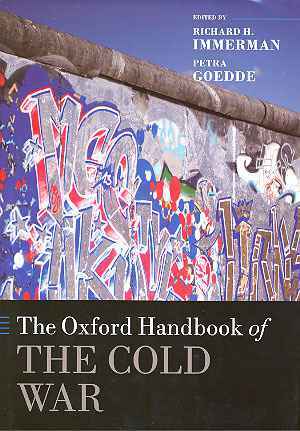 The end of the cold war, a topic of ongoing debates among historians, deserves a more in-depth treatment than the Oxford Handbook provides. Obviously, the editorial policy to leave out surveys of “traditional” cold war topics comes at a price. The Oxford Handbook is of limited use for students and general readers, who will have to look elsewhere for basic information on the major crises and confrontations during the cold war. In contrast, historians will assess the Handbook’s contribution to scholarship by pondering the extent to which it redeems its claim to “liberate the cold war from the bipolar perspective without denying or minimizing the vital significance of that conflict” (p. 4). Going beyond the superpower rivalry, the editors suggest, will help us see other, perhaps even more important, developments such as the central role of the United Nations, human rights, decolonization, and, most of all, globalization. Among the essays listed under the heading of “Conceptual Frameworks,” Akira Iriye’s “Historicizing the Cold War” is arguably the most provocative. Scolding historians of international relations for their alleged obsession with geopolitics, security, and war, Iriye contends that “after the Second World War, non-geopolitical developments became so powerful that to give the cold war the privilege of defining the postwar chronology would be a grave distortion of history” (p. 17). The cold war, he continues, was a “footnote in the longer and ultimately more consequential story of decolonization” (p. 18) as well as a “footnote to human rights history” (p. 19). Most importantly: “Globalization was a far more significant and enduring historical development than the cold war.” (pp. 29–30) Nuclear weapons, according to the author, were the cold war’s only “major imprint on contemporary history” (p. 21), yet, “the real winners [of the cold war] were the non-national, transnational forces that united and integrated nations and peoples, forces that were often submerged under the dictates of geopolitics but proved far more enduring as agents of historical transformation” (p. 29). The cold war, we are led to believe, was little more than a temporary setback in the ultimate triumph of globalization and transnationalism. Yet Iriye’s account not only amounts to a remarkably optimistic, almost teleological, master narrative of globalization, it also ignores that the cold war was itself a major driving force of globalization, as Hyung-Gu Lynn persuasively argues in his essay, focusing on communications technology, transportation, and international agreements. Apparently, few other Handbook authors share Iriye’s dismissal of the cold war as a “minor theme in the broader history of globalization” (p. 17), nor do all authors readily forfeit geopolitics and, for that matter, the significance of the nation state. As the essays by Ian Jackson, Geoffrey Warner, Vladimir Pechatnov, Vladislav Zubok, and Campbell Craig bear out, power wielded by nation states remains an indispensable category for analyzing the cold war. Pechatnov is to be especially commended for his clear-cut answer to the key question why the Soviet-American rivalry ended like it did: “First, the West had the better model […]. Second, the West had much greater resources at its disposal than the Soviet bloc […]. Third, […] the US possessed a better cold war strategy.” (p. 117) Even if averse to “Western triumphalism,” none of the Handbook contributors makes a serious effort to defend the viability of the Soviet system, let alone deny its repressive character. No review of 1,200 words can do full justice to the wealth of information, insight, and intellectual challenges that the thirty-four essays of the Oxford Handbook of the Cold War comprise. Nor should reviewers criticize editorial choices simply because they would have made different ones. I admit that I was skeptical of the editors’ deemphasizing “traditional” cold war topics and issues in what after all claims to be a “handbook”, and I confess that I have to be fully persuaded yet. Still, I have greatly benefited from reading the book as will all scholars who are interested in the key conflict that defined global history in the second half of the twentieth century and will arguably remain a vibrant field of historical scholarship in the foreseeable future. Manfred Berg: Rezension zu: Immerman, Richard H.; Goedde, Petra (Hrsg. ): The Oxford Handbook of the Cold War. Oxford 2013 , in: H-Soz-Kult, 06.09.2013, <www.hsozkult.de/publicationreview/id/rezbuecher-20605>.